Technical knowledge is required to start a multi-vendor marketplace. This is the way we used to think. But the concept is a myth as even a non-technical person can easily create a marketplace nowadays. This platform is different from the traditional marketplace. This is even different from running an online store. Multiple vendors come under one virtual roof in this system. People who lack a basic understanding of this should learn or research a little more about what are the things required to start a multi-vendor marketplace. A multi-vendor marketplace is not a single person operating an online store. It is the transformation of a store into a marketplace. One admin invites vendors or sellers to come under his roof and set a shop there. This is the accumulation of a good number of stores brought under one roof. In this platform, principles are different than we usually know. So some of the famous multi-vendor marketplaces are Amazon, e-Bay, Alibaba. These online marketplace visitors are able to buy multiple products from multiple vendors from the same place. One may have completed a degree in business. Still, a multi-vendor marketplace may seem complicated to them. Magneto marketplace, Sharetribe, WordPress Marketify are big names in multi-vendor marketplace platforms. Amazon, e-Bay use their own platforms. A proper understanding of the target customer: This marketplace not only brings a number of vendors into one place but also integrates varieties of customers. To run it successfully you need to know the psychology of those customers. Proper implementation of the understanding: Once you know what they look for and why they look for it, you have to implement that understanding in business. You have to take action and respond according to their need and keep experimenting. Business plan: This has become a huge figure now. You will have to reinstate a proper business model & plan now, to implement that needs to be done for the marketplace. Choosing the right Platform: Any business plan to be executed properly needs the right platform. So, It is for you to decide whether you want to start your business with WordPress or some other platforms. Get a website: Designing your website according to your plan is a technical work. In case of a multi-vendor marketplace, you have to be careful about where you are creating the website, what plugins, extensions they have to offer etc. Each of these sections has sub-sections. If someone is able to take care of all these properly then he/she is ready to start a marketplace. Lacking any of these may result in massive failure. Now let’s have a look when we should not take this risk on us. The online transaction increases every moment now. This is so appealing that people frequently turning their stores into marketplace inviting sellers. But the marketplace includes a lot of responsibilities. So, one should stop and think before taking the step. Here are some suggestions on when you should not turn your store to the marketplace. If you just started an online business. You are still new to this. You should spend a little more time to understand the market. Because this involves capital too. If you don’t have right technological support your marketplace may fall down. You have to be very creative while creating a marketplace website. The mentality of creating a monopoly is important according to Peter Thiel. If one lacks the spirit of this then it should wait. Continuous upward performance helps to create a monopoly but it is hard to achieve. In a marketplace, the theory of fitting everyone into one size may fall short. As customer has increased so should be the products. Owner and vendors should keep the products updated and available. Customer service is part and parcel of a multi-vendor marketplace. Otherwise, why should one come to your store? If this is not ensured you probably should hold on. An owner must have enough resources to attract vendors. If one lacks the capability of maintaining balance then it is still a long way to set for a marketplace. Lastly, a strong marketing team or strategy should be there. Otherwise, the marketplace is sure to fall down. Marketings may be individual products branding or as a whole. It may be on social media or on other places. So, marketing is the most important thing for online business. If you lack any one of these then it is really for you to wait for the right time. But one thing everyone should keep in mind – success comes to those who take the necessary risks. Such was the case with Sanjay Sethi, the co-founder of ShopClues. He comes from a technical background. And he worked with e-bay. He became aware of his position first then went on creating ShopClues. This has now become one of the biggest online marketplaces of India. That risk should be an Aristotelian risk. According to Aristotle, justice was not only driven by morality but also with the demand of the situation. While taking the risk one should not stop reasoning. And should risk to the point you can handle. But here is a good news for you. WordPress which was primarily associated with blogs now helps you in setting e-commerce store. 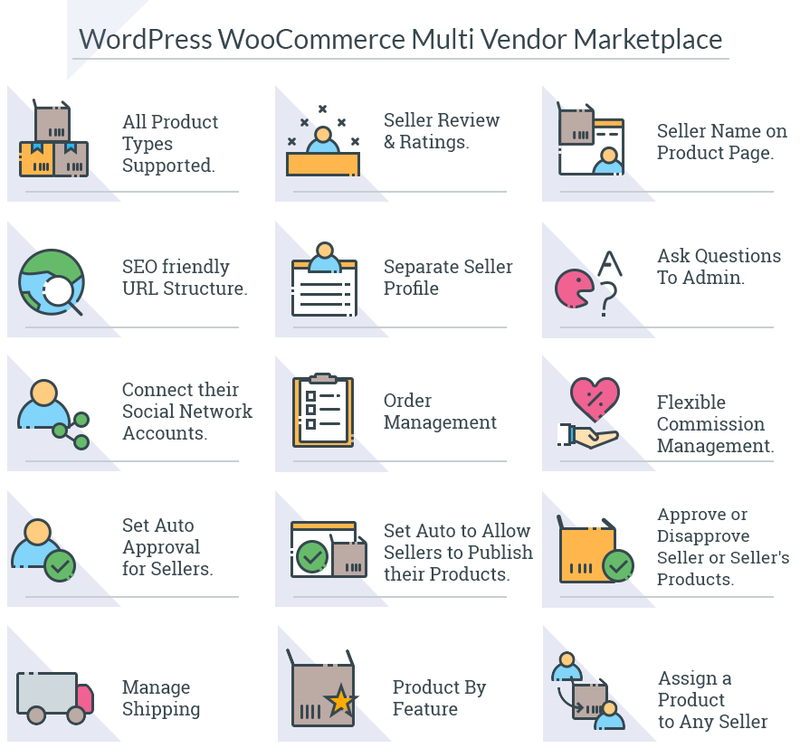 Now you can transform your shop into a marketplace with WordPress. 72 million users now use WordPress for their e-commerce business. WordPress offers packages to every sort of users. It thinks about small businessmen and also about enterprises. Many free plugins are there in the market now. They have made the journey with WordPress like a journey of forever now. Because of WorPress.org, one doesn't have to switch when business turns huge. It is really easy to use WordPress as a marketplace. You just need to have a domain, install WordPress and then activate WooCommerce. WooCommerce is a WordPress plugin that allows you to create an online store easily. Around 30% of world's online stores are built using WooCommerce itself. Now there is a WordPress multi-vendor marketplace plugin named Dokan is in the market. This offers easier scope to the entrepreneurs to turn their stores into a multi-vendor marketplace. This is one of the most powerful marketplace plugins now. And it is mentioned in one of the blogs of a popular site codeinwp.com as well. A number of popular online multi-vendor stores like Mash.ie, MyMuslimMall.com etc. have become successful using this Dokan plugin. The thing most appealing about Dokan is, it is flexible and easy to use. It applies the psychological trick of “help” than being a “helper”. This is right. It is said if our kids are taught to help each other they become more co-operative. Dokan uses this psychology. It is here to help people. To merge the interest of WordPress and WooCommerce. When you have WooCommerce installed in your WordPress, all you need to do for Dokan is to go to the dashboard, then on the plugin tab look out for Dokan-lite and install it. After installing Dokan you can select which features of it you will primarily use or which package you will need. Though Dokan pro version requires to be bought that would include a zip file to be uploaded once you have purchased it from the official link. Why Should You Go for Dokan? There is no insistence on using Dokan. Dokan lets you access into it’s free comprehensive Demo. Starters can use it and then decide about whether to become a permanent user of it or not. But most people like Dokan for its design as it is user comfy. It has several packages. Users can choose according to their needs and requirements. Dokan takes care of the most important thing on e-commerce that is customer support. It offers vendors a place of their own. The transaction in Dokan is really easy and it helps you to know about all the product it has at a glance. Dokan’s lite version also lets you have some of these experiences. Yes! Take a deep breath! If you lack the credentials to start a multi-vendor marketplace now, then you should not worry. Wait a while, adopt and adapt the system. Then take the risk. And remember if you are afraid on your way as beginner Dokan multi-vendor marketplace is always here for you. If you are still having doubts then you can at least try out its Free Demo. 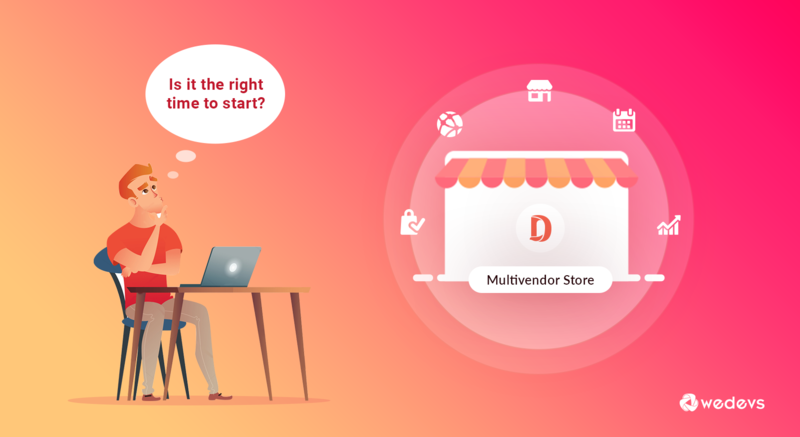 Feel free to let us know when do you feel is not the right time to start a multi-vendor marketplace in the comments section below.